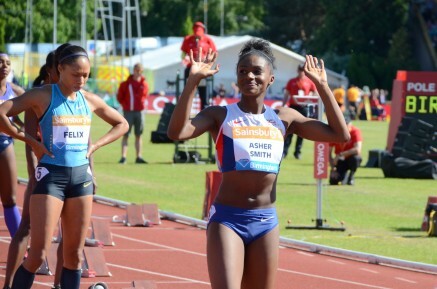 7th June 2015 – Just two weeks after breaking the British 100m record Dina Asher-Smith (GBR) smashed her personal best for 200m with a brilliant run at the latest IAAF Diamond League event in Birmingham. Lining up with the current Olympic Champion Alyson Felix (USA) on her inside the 19 year old World Junior Champion was anything but overawed and powered round the bend to lead into the straight. In a three way battle for the line, race winner Jeneba Tarboh (USA) and Felix just edged past Dina in the final few strides but her time of 22.30 seconds moves her to number two on the British all-time rankings list. In the middle distance events Vincent Kibet (KEN) led for a long way in the mens 1500m but was passed in the final 100m and had to settle for third. Magdalyne Masai (KEN) ran another personal best in the steeplechase, this time dipping inside 9:30 for fifth place. Jeremiah Mutai was also fifth in the 800m. Of the other British athletes competing Matthew Hudson-Smith (GBR) ran a new personal best for 300m when taking fifth, Chris Tomlinson (GBR) jumped a seasons best for seventh in the long jump and Stephanie Twell (GBR) also gained a seasons best in the womens 1500m. Away from Birmingham, former World Champion Vivian Cheruiyot (KEN) won the Kenyan Police Championships over 1500m in a time of 4:14.7.